Top Notch Material: Sargento Ultra Thin Love! "All The Taste, 45 calories or less"
I was recently selected to review the new Sargento ultra thin cheese slices Voxbox from Influenster and we are just in heaven! Since they are so thin, we get the same wonderful Sargento taste, but with a lot less calories! I also received a super nice lunch box that I have been sporting to work. You can view this on my instagram account. 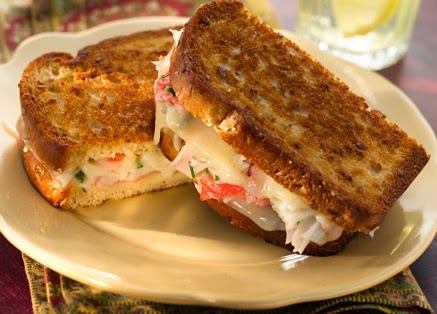 While I did not make any of the recipes listed on the Sargento site, they all look incredibly delicious and the Grilled Crab Salad and Swiss sandwich is top on my list to try! Does this not look amazing!!!! While I am not a chef by any means, I will tell you that my hubby is on a low carb diet so cheese is a staple around our home. The Sargento came in just in time before we took a trip to Disney. I made the whole family sandwiches, but for him, I made him meat and cheese rolls. He loved them and even went back for the last of the cheese when he was done. Sargento Ultra Thin Slices was a hit all around. Paige received a coupon for a free pack of Sargento ultra thin cheese, a lunch box and a $1 off coupon from Influenster for my consideration while writing this review. If you have any questions please contact me at nursemommypaige at yahoo dot com. This does look amazing. I am impressed on how well it looks. This looks simple but would be fancy at a restaurant!! Thanks for the idea! Yum that sure looks good! I love cheese a little too much so I should probably switch to the thinner slices to cut down on calories and fat.